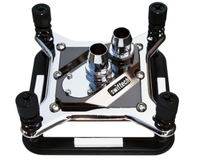 The sucessor to the Swiftech GTZ is here promissing improved cooling and higher flow rates. 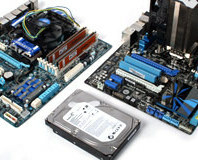 Everyone loves a bit of watercooling, and the original Zalman Reserator was a popular hit, so what does the updated Reserator XT add to the equation? Is it worth the hassle or do you just want to buy it so you can stroke it all day? AMD has announced the arrival of the ATI Radeon HD 2600 and Radeon HD 2400 series graphics cards today. COMPUTEX 2007: HIS is showing off what it claims to be the world's first DirectX 10 compliant AGP graphics card. COMPUTEX 2007: Sapphire was showing off its next generation dual-GPU graphics card based on a pair of ATI Radeon HD 2600 XT graphics processors. ATI Catalyst gives a much needed performance improvement in OpenGL and also includes Catalyst Control Center: Linux Edition Version 1.0. Earlier this week, AMD announced the ATI Radeon HD 2900 XT. We've spent the last few weeks familiarising ourselves with the architecture behind the hardware. Join us as we find out whether R600 was worth the wait -- single card and CrossFire testing included. Former CEO of ATI, Dave Orton, has revealed that AMD's upcoming ATI R600 family of graphics processors will launch top-to-bottom in a matter of weeks. With the Radeon X1950 XT 256MB now retailing for just over £140, it has been pushed into a different price bracket. Does the drastic price drop make the Connect3D X1950 XT 256MB one to consider while we're all waiting for DirectX 10 games and mid-range next-generation hardware to turn up? Do you want a 7900 that's majorly overclocked out of the box? EVGA has this 'superclocked' version, but do the enhanced speeds make a difference? ATI's soon to be launched Radeon X1900GT is already for sale at online retailers in the USA - retailers list specifications. With the X1900 series of cards out, X1800 cards are coming down in price. We have a GeCube card here today, which overclocks decently. However, can it compete with the X1900 series on value? We investigate. Looking for a new ATI card? We've got three X1900 XTX cards, one X1900 XT and one X1900 All-in-Wonder. We run them through our range of real-world performance tests, overclock them, and work out which one is best value for money. The X1800 XT OC is the latest weapon in the NVIDIA / ATI war of attrition. A little slower than the 7800 GTX 512MB, it is at least (at last?) available to buy. Early indications sugggest that Connect3D will be the first of ATI's board partners to ship Radeon X1800XT's in the UK, starting on November 2nd.